Southern Rockies Nature Blog: Would You Have Eaten What George Melville Ate? Jeannette's boats are separated in a gale. Illustration from "In the Lena Delta"
In July 1879, the USS Jeannette, a former Royal Navy gunboat with both sails and a steam engine, left San Francisco Bay for the Bering Strait and the Arctic Ocean beyond. Its purchase and outfitting expenses were chiefly covered by newspaper tycoon James Gordon Bennett, Jr., sort of the Ted Turner of his day, with the ship being commissioned by the US Navy and given a Navy crew—plus two native Alaskan dog handlers and a veteran whaling captain to serve as "ice pilot." For two winters Jeannette explored northeast of Siberia, looking for a hypothesized open water projected — by eminent geographers— to exist north of the band of pack ice. For most of the time, of course, the ship was stuck in the pack ice, carried along by the polar drift while the crew carried out scientific observations and visited some hither-to unknown islands. In June 1881 Jeannette was released by the ice—but then re-caught by moving floes. Despite the hull reinforcements added in preparation for the voyage, this time the ship was crushed. The crew had warning and had evacuated many supplies, sleds, dogs, and three of the ship's boats. And then the hard part started. 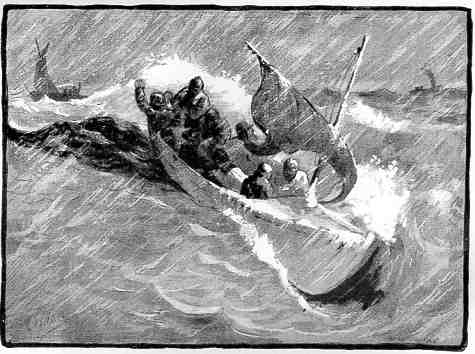 The story of Jeannette, the sinking, the horrible sled journey south, south, south, and the open-boat voyage toward the Siberian cost are told in Hampton Sides' book In the Kingdom of Ice, and if you like stories of adventure and endurance, you will devour it like a starving sailor eats raw fish. But there is more. When the story shifts to the struggles of the castaway sailors and the search for the missing, Sides relies quite a bit on In the Lena Delta (1884), an account written by the senior surviving officer, George Melville, the ship's engineer. So I had to get it. With an axe the rib pieces were soon severed from the back-bone, and then from the inside of these the natives cut strips with their sheath-knives and handed me a chunky moral from the loin, as breakfast. I bit into it without any ceremony, while the dogs clamored frantically for a share. So long as it remained frozen the meat did not exhibit the vile extent of its putridity; but directly I had taken it into my mouth it melted like butter, and at the same time gave off such a disgusting odor that I hastily relinquished my hold upon it, and the dogs captured it at a single gulp. The natives first stared in genuine astonishment to see me cast away such good food to the dogs, and then burst forth into hearty laughter at my squeamishness. But I was not to be outdone, much less ridiculed, by a Yakut, and so ordered some more, perhaps a pound of the stuff, cut up into little bits. These I swallowed like so many pills, and then gazed on my Yakut friends in triumph; but not long, for in a little while my stomach heated the decomposed mess, an intolerable gas arose and retched me, and again I abandoned my breakfast — my loss, however, becoming the dogs' gain. At this the natives were nearly overcome with mirth; but I astonished them by my persistence, requesting a third dose, albeit the second one had teemed with maggots; and swallowing the sickening bits as before, my stomach retained them out of pure exhaustion. Remember this the next time you notice that the package of meat in your refrigerator is past its expiration date. And In the Kingdom of Ice is a great cold-weather read. Unless you are in Yakutsk (a locale that figures in the story), it will make your winter seem like balmy spring.